Low carb smoothies are among the best treats on the ketogenic diet. So good and nutritious, they make meals simple and quick, and can also be effective instant cures when you’re fighting the dreaded keto flu. They’re perfect anytime, but especially when you’re not hungry but you need to fill up. 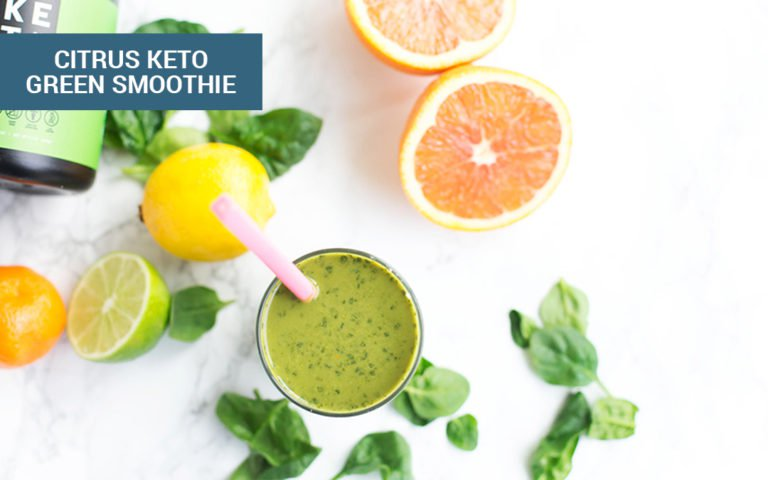 The best keto smoothie recipes are those engineered to help you achieve your fat, protein and micronutrient macros while staying very low carb. Smoothies have been replacing meals since the 80s. With more recent research on the benefits of good fats, smoothies have evolved, and on keto, the huge difference is our smoothies use more healthy fats and little to no sugar-laden fruits. Aside from your favorite high-powered blender, stock up on your favorite keto ingredients and play with them to create keto dishes, desserts, fat bombs and smoothies! Mix and match, discover flavors and textures. The more healthy fats you eat in the ketogenic diet, the faster you’d get fat-adapted. Fat adaptation smooths the gears as you switch from using glucose to burning ketones for energy, and because of this, you would start to crave carbs less and less. Fat also keeps you fuller longer so you eat fewer calories during the day. Including keto star fats in your smoothies helps so much for your ketosis and weight and fitness goals. Your options include coconut oil, almond butter, cashew butter, natural peanut butter and avocados. Remember to choose a sugar-free option for the nut butters. Your choices may be limited, but you do still have a bunch of delicious fruit choices on keto. Berries, for example, have a high fiber content and can be enjoyed in moderation on a ketogenic diet. On keto, only the low-carb and nutrient-dense veggies remain. Added to keto smoothies, they immediately increase the vitamins and minerals in your cup, boosting your immunity, skin health, and brain and organ function. These boosters are called superfoods for a reason: they add so much to the nutrient profile of any dish. The beauty of using them in your smoothies is you may not even taste them if you happen to be a picky eater, but you’re still gaining all the benefits of the nutrients! Many superfoods are ingredients in high-quality supplements, like Perfect Keto Micro Greens Powder. A smoothie wouldn’t be a smoothie without the liquids. They are the first thing you put into your blender. Less liquid, thicker smoothie. More liquid, smoother… um, smoothie. Your options for keto-friendly liquids or drinks: almond milk, cashew milk, coconut milk, MCT oil, high-fat yogurt or just plain water. Make sure the nut milks are unsweetened, or make your own! This ingredient is optional. Keto veterans already know how flavorful food is without the need for sweetening, but beginners may need a little bit to make their transition easier. If you have added flavored keto supplements or keto protein powder, you can reduce or skip a sweetener entirely. The top four sweeteners perfect for your low-carb keto diet are: stevia, erythritol, monk fruit and Swerve. 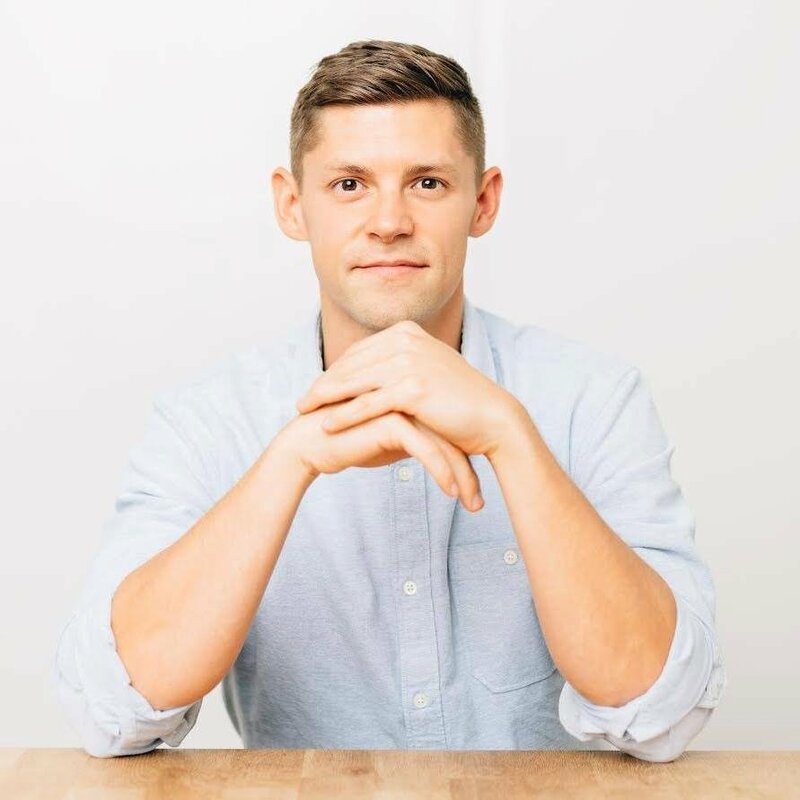 So much easier than trying to source and store a high-quality superfood, supplements amplify the nutrient profile of your keto smoothies conveniently. Many of our keto recipes use Perfect Keto supplements to supply you with ketones, micronutrients, amino acids and add flavor! But not all supplements are created equal. How do you know you’ve purchased something really good? It has no additives and preservatives. With the wrong supplements, you lose all the benefits and only take in useless fillers. Read our guide on Using Supplements on Keto. Smoothies are no longer huge sugar bombs. 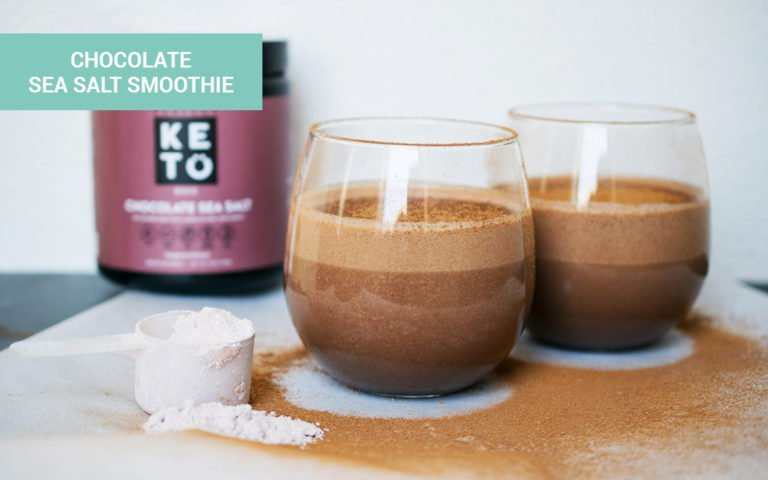 Our keto smoothie recipes are low glycemic, very low carb and are all smart choices for any time of day, but especially pre- or post-workouts, as your breakfast on-the-go, or your lunch companion to stave off afternoon sluggishness. Aside from superfood acai, almond milk and almond butter also make this smoothie a nutrient powerhouse. Almond milk is dairy-free, containing high protein and fiber content and a multitude of vitamins and antioxidants [*]. Just make sure you make your own or get an unsweetened, high-quality almond milk. Got a little confused with the citrus ingredients in this recipe? You are on the right track avoiding oranges and lemons. They might be rich in vitamin C, A, magnesium and potassium but unfortunately, the sugar content is extremely high. Orange and the lemon zest is a different story! Aside from the appealing smell, orange and lemon zest produce essential oils that serve as antioxidants. 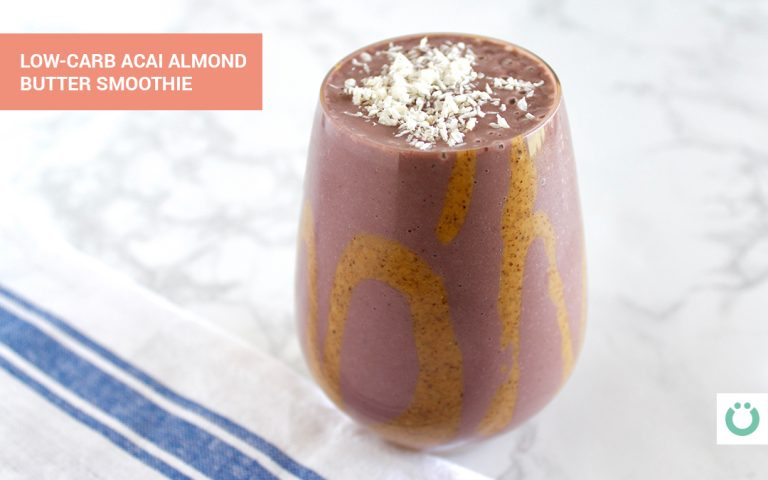 [*] This smoothie fights inflammation and free radicals. Chocolate makes us happy. Just a fact. 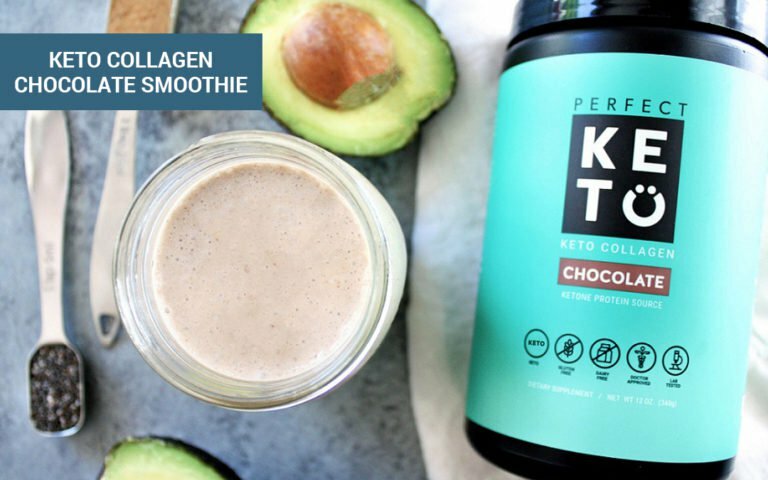 This recipe will give you that treat guilt-free through our top favorite, chocolate Perfect Keto Collagen. This smoothie rocks avocado, too, one of the stars of the ketogenic diet for being low-carb, sodium-free, low in saturated fats and high in vitamins and minerals. 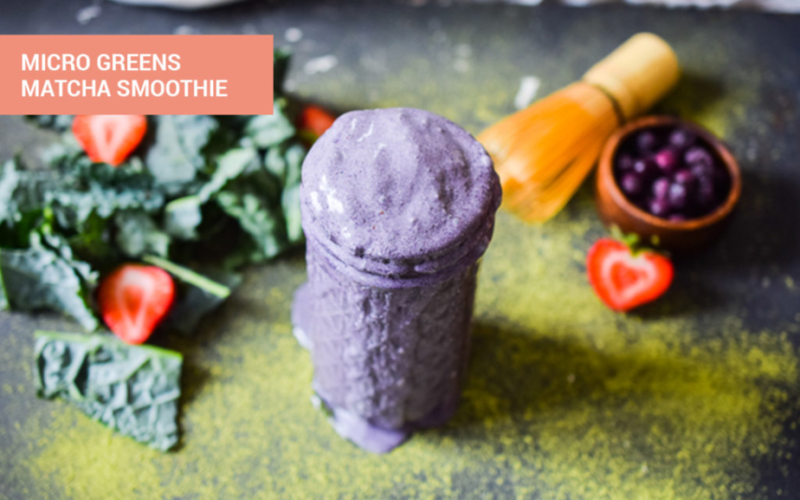 This smoothie packs a powerful nutrient punch from matcha, Perfect Keto MCT Oil Powder, and Perfect Keto Micro Greens. Look at that distinct blueberry color. Blueberries, another superfruit, are full of anti-inflammatory components that could help Parkinson’s and Alzheimer’s disease[*]. Before keto, adding salt to an already salted food was a health issue. Now on keto, you’ll find yourself making sure you’re getting enough sodium! You need approximately 2 teaspoons of salt a day, or more depending on your activity level. You lose sodium when you sweat. You get sodium from beef, fish, healthy dairy like cheeses and butters and from natural spices and seasonings. When it comes to salt: unrefined sea salt is better: minimal processing means more minerals compared to normal table salt, retaining other mineral content like sodium, magnesium, calcium and potassium. We talked about salt because we’ve talked enough about chocolate, and who needs to talk up chocolate?! Smoothies are meal replacements, not a side dish or drink along with your meal. Fast food chains and the regular American diet has accustomed many of us to drinking milkshakes and smoothies with our meals. Keto smoothies — and other green smoothies for that matter — don’t work that way. Start taking smoothies right — as a standalone meal or snack. These recipes will make you feel full so you’d find you don’t need to eat anyway. This leads to a feeling of success and progress, especially if you’re taking the ketogenic diet for weight loss. But you still need to eat. Ketosis is not healthy by itself. Yes, you’ll get into ketosis, but you’d also be leading your body into dangerous territory if your macro and micronutrient intake isn’t balanced. It’s all about what you eat.